The rescue mission that moved 29 lynx away from the fire at the Iberian-lynx National Breeding Center was crucial to save them. The action, involving as much as 70 people, transported the animals to three different centers in Spain, in face of impending wildfires devastating the area around the Center in Silves, Algarve. The region in the Monchique sierra has been fustigated since August 3rd by the larger wildfire recorded this year in the European Union, with 27.000 hectares burned, and the lynx’s National Center was severely hit, according to the authorities. Flames hit the Centre this Wednesday late afternoon, just shortly after the animals were taken to safety. Later, they were transferred to three Spanish breeding centers. Portuguese Forest and Nature authority (ICNF) has confirmed that all Iberian-lynx brought to Spain are safe and in good conditions. The lynx spent Wednesday night in a school in nearby Lagoa, Algarve, as the authorities assessed how severely the Breeding Center was being hit by the wildfires. By next morning, it was evident that the facilities were too damaged and there was no possible comeback. A decision had to be taken: the 29 lynx were to be transported to the Spanish breeding centers El Acebuche, La Olivilla and Zarza de Granadilla. 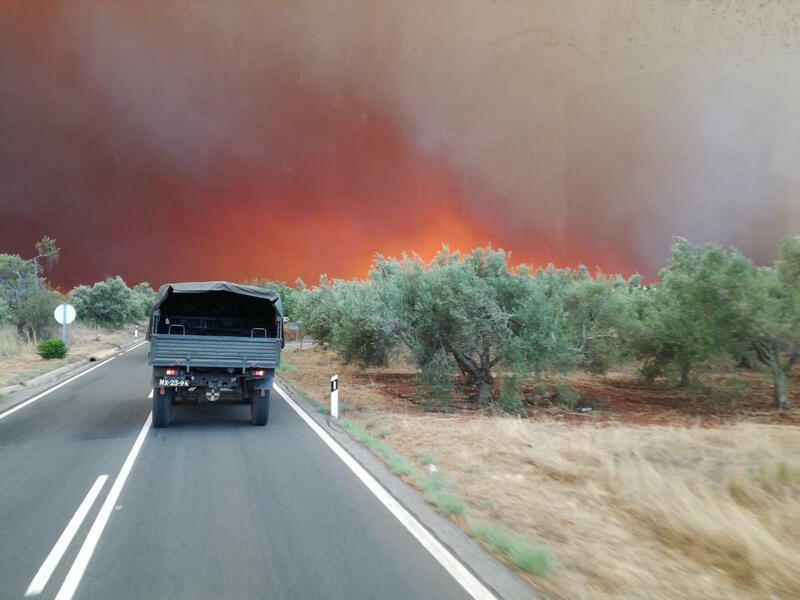 About 70 people were involved in the evacuation and transportation from Silves to Spain. The list is vast and highlights the coordination needed to accomplish the mission in dramatic moments. It includes personnel from Portuguese and Spanish government and local authorities, nature rangers, fire specialists, experts in wildlife, veterinarians, the staff from Silves’ center and the three Spanish receiving centers and traffic authorities from both countries that followed the rescue convoy. 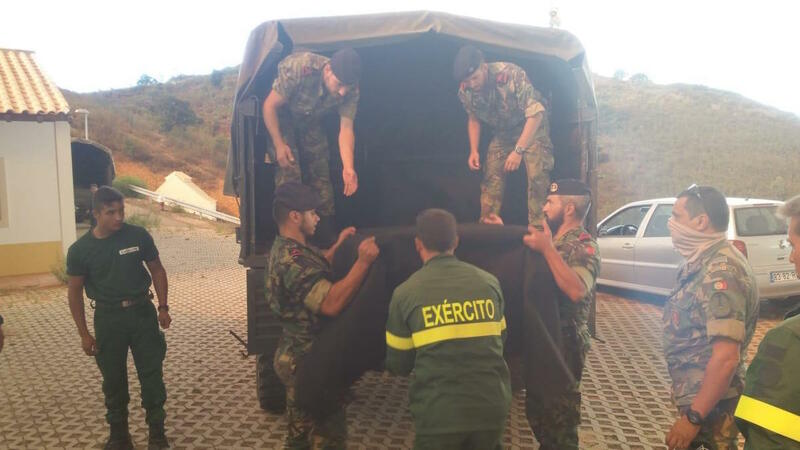 Additionally, the Army and a special marine force from the Navy were instrumental not only by providing the vehicles for taking the endangered species to safety but also by helping to keep the fire away from the breeding center in Silves for as long as they could. The widespread fires that struck Monchique mountain range since Friday August 3rd mobilized over 1.300 firemen and were only dominated, but not extinct, one week after. The lynx were distributed according to the available space in each breeding center in Spain, as well as the animals’ main features, like mothers and their cubs or couples. Hence, 12 lynx were moved to La Olivilla in Jaén, nine to Zarza de Granadilla in Cáceres and the remaining eight to El Acebuche in Doñana National Park, Huelva. “The cooperation between both countries has been perfect”, says Miguel Ángel Simon, the LIFE Iberlince director, to Wilder. He also underlined the prompt response to the rescue contingency plan activated this Wednesday, crucial to avoid an even bigger calamity.